Last month my friend Patrick and I ventured east with our little teardrop trailer to explore camping opportunities in the Wallowa Mountains. We found a sweet little campground with just 4 sites along the Lostine River about 13 miles outside of the little hamlet of Lostine. Unfortunately, the saloon in town was closed up and the only business that appeared alive was the Blue Banana Coffee Shop. No worries! We were fully stocked and looking forward to some semi-solitude. 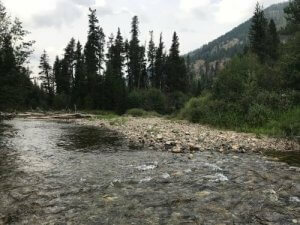 The Lostine originates in the Eagle Cap Wilderness and runs through two towering mountain ridges until it joins the Wallowa River in the town of Wallowa. The water was low and crystal clear during our trip. I brought 4 weight rods (could have used a 3 weight) and light leaders. We stopped at the Joseph Fly Shoppe to get the low down on the local fishing report and to pick up some flies. Fishing was good for smallish feisty rainbows about 6 – 11 inches and the fly of the hour was a grey parachute Adams in a size 12 or 14. Occasionally I hooked fish on a hare’s ear dropper. But this is not a fishing report, really. The great pleasure on the water was seeing three separate Chinook spawning pairs with the females building redds right in the camp water! 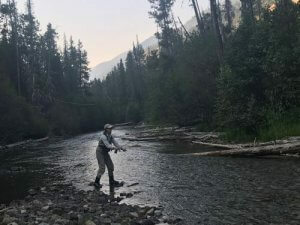 A fishery biologist from the Nez Perce Tribe along with an Oregon Department of Fish and Wildlife (ODFW) intern were conducting spawning surveys when I came across them while moving up to the next pool. They tagged the spot and Patrick and I came back several times in the next 2 days to watch the progress. The female looked pretty bright and energetic. She worked very hard to build up the castle for her little ones, checking the flows, resting, then going back to work. The first evening I watched for about an hour and finally the male ventured out to hold close to his mate. I thought that was going to be the moment of their culmination! Oh, but he looked worse for wear. Nearly black as charcoal with large white patches on his back, head, and tail. But the female was not satisfied with her redd and went back to working. He tried valiantly to hold sentinel next to the redd but the work was too much and after about 10 minutes he went back to a bubbly drop off at the far bank. Next day she was still working but I never saw the male come back out. We saw two more pairs working on redds during our stay. Such a treat! Lostine River salmon have to navigate 8 dams on the Columbia and Snake Rivers before they head up the Grande Ronde, and eventually find their way to the Lostine. This salmon population is part of the ESA listed Snake River spring/summer Chinook. In the mid 1990’s the Nez Perce Tribe partnered with ODFW to develop a Chinook hatchery on the Lostine. Funded by the Bonneville Power Administration as part of their mitigation program, the hatchery began a conventional broodstock program for supplementation in 2000. Since 2012, supplementation has been solely from conventional broodstock. 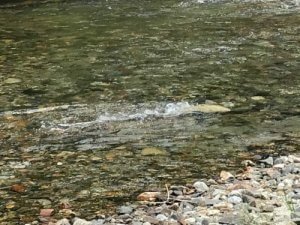 The Lostine Hatchery releases about 250,000 juvenile Chinook smolts annually. 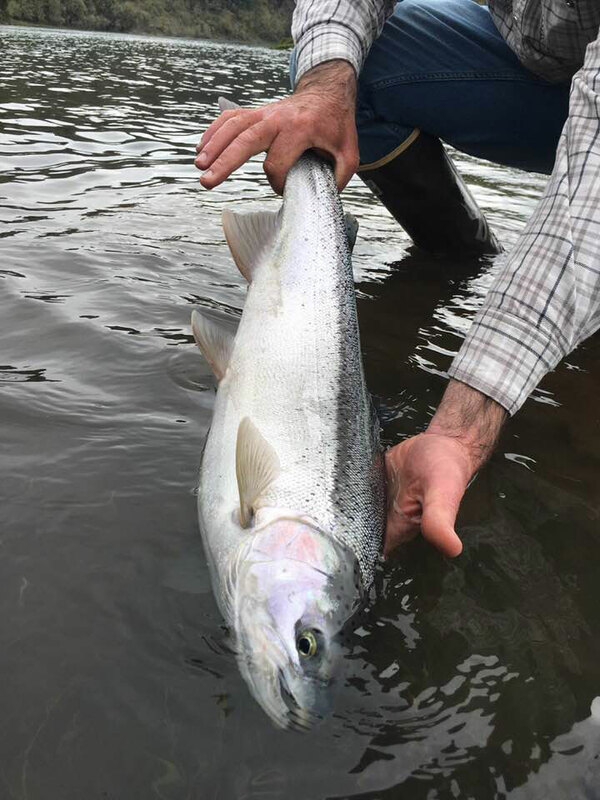 The Nez Perce publication, Evaluating Spring Chinook Salmon Supplementation in the Lostine River, Oregon:2016 Annual Progress Report noted the escapement to tributary of age 3-5 Chinook at 1,723 (655 natural-origin and 1,068 hatchery-origin). I don’t know if the inspiring pairs of salmon we watched were of hatchery or wild origin. I do know we were heartened and humbled to see the females work so diligently to shape their redds. And stately yet wasting males had our best encouragement to stick by their ladies – til the end.